A Time Of Victory, Tensions For Conservatives : It's All Politics CPAC gives conservatives a chance to boast of gaining House control. But tensions are visible, too, as establishment Republicans warily eye Tea Party conservatives. 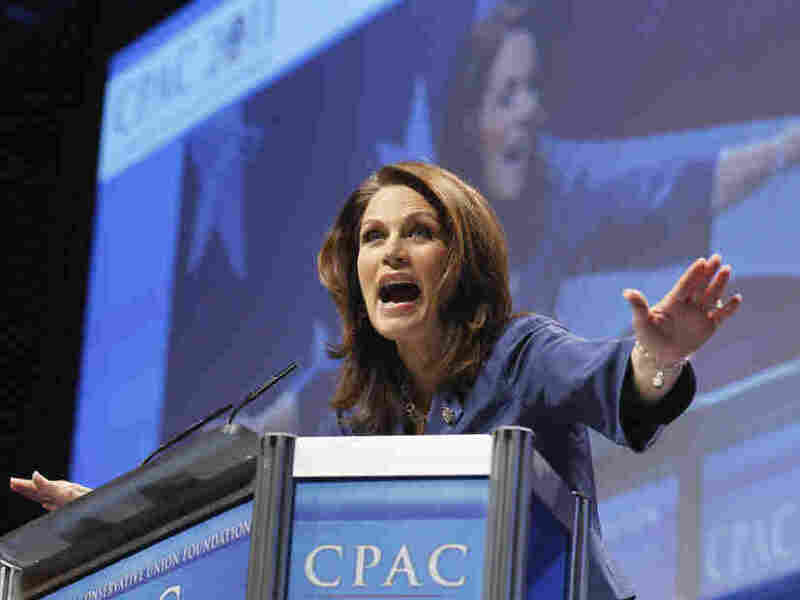 Rep. Michele Bachmann (R-MN) gives the first speech at the Conservative Political Action Conference , Feb. 10, 2011. One of the nation's most widely watched annual political meetings, the Conservative Political Action Conference, is underway in Washington, and this year it's drawing attention for a few reasons. So it's one of the first chances conservatives have had at a national political meeting to savor their party's return to power, at least over one congressional chamber. But the conference comes at a time of tensions within the conservative movement, as establishment types and Tea Party activists warily eye each other. Ditto for social and fiscal conservatives. Some of those strains were visible elsewhere in Washington, as House Republican leaders sought to find common ground not with Democrats but with some of their own new Republican lawmakers, who view their leaders as too timid in cutting government spending. CPAC also gives the new stars of the House Republican conference a chance to introduce themselves. And some of the more established Capitol Hill figures, especially those with political ambitions for other offices, got a spotlight that could aid their bids for support. The conference also gives activists from the ascendant Tea Party movement another opportunity to flex their muscles on a national stage and to remind congressional Republicans that they are watching their performance. This year's conservative gathering features not just new members of the House Republican majority, like Rep. Kristi Noem of South Dakota and Rep. Allen West of Florida, but a number of potential presidential candidates. Governors Mitch Daniels of Indiana and Haley Barbour of Mississippi and former governors Mitt Romney and Tim Pawlenty, who were chief executives of Massachusetts and Minnesota, respectively, are among the presidential hopefuls finding CPAC irresistible this year. Another possible presidential contender, Newt Gingrich, is rarely boring when he appears at such gatherings. Former Defense Secretary Donald Rumsfeld is making the scene, too, and will no doubt plug his new book. Two potential presidential candidates who won't be at CPAC, however, are Sarah Palin, the former Alaska governor and 2008 GOP vice presidential nominee, and Mike Huckabee, the former Arkansas governor. David Keene, long-time head of the American Conservative Union who is leaving to become the National Rifle Association's president, has made critical public comments about Palin. He said last summer, for instance, that with time's passage, there are even more questions about her readiness to be president than in 2008. Meanwhile, Huckabee has criticized CPAC, saying the nearly 40-year-old conference has ever less influence on conservatives, calling it "increasingly libertarian and less Republican." This year's CPAC was controversial even before it started because of the ACU's decision to give GOProud, a gay rights group, a place at the conference. The decision created something of a wedge between those conservatives who make so-called family values their priority and those who don't, like the libertarians of whom Huckabee spoke.